While the Tamron 70-200mm f/2.8 Di VC USD Lens is not Tamron's first 70-200mm f/2.8 lens, it is their first version to include vibration control. VC alone is a great upgrade feature, but the upgraded image quality in this lens is also big bonus. This lens 70-200 VC overall great image quality and good performance at a moderate price. There are few of us that can't make great use of a stabilized 70-200mm f/2.8 lens. 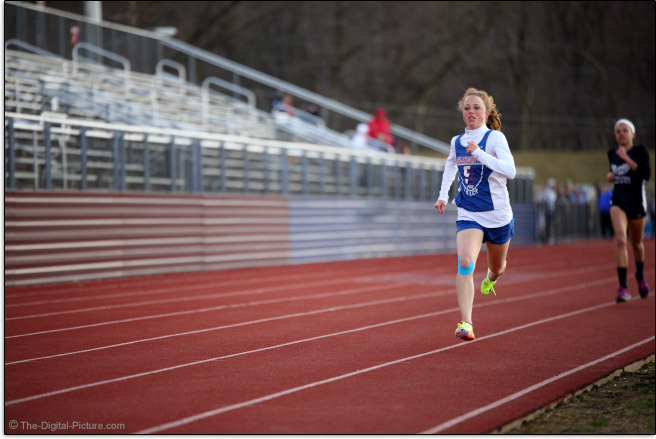 The 70-200mm focal length is what I often recommend for a photographer's second lens. This focal length range falls nicely above most general purpose zoom lenses and works well for more-distant subjects or for more-compressed perspectives. Here are a pair of 70-200mm focal length range examples. The New York City skyline comparison was photographed from Liberty Park in Weehawken, NJ. 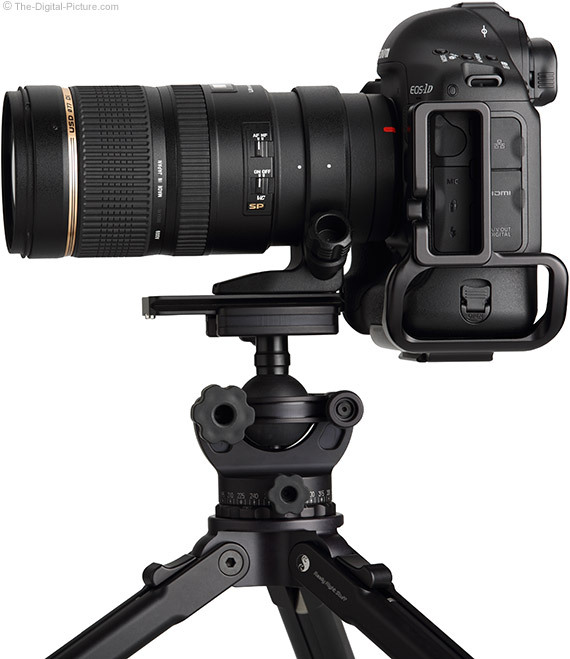 APS-C/1.6x FOVCF sensor format DSLR owners will get an angle of view similar to a full frame 112-320mm lens. Have kids? Or grandkids? This is a great lens to chase them around with. I commonly recommend such a lens for portraits, for weddings, parties, concerts and other indoor events, for indoor and outdoor sports, for landscapes and for large and/or close wildlife. Critical for many uses, and especially critical for an indoor event lens, is stabilization. 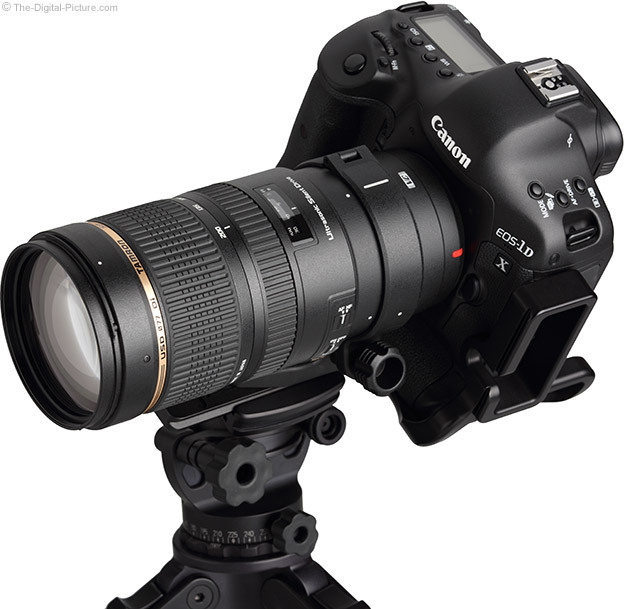 This lens has it, Tamron calls it vibration control (VC) and it works very well. The Tamron 70-200 VC's 4-stop image vibration control keeps the viewfinder stable on startup and shutdown and keeps its presence down by being very quiet. You will hear some light fluttering in the lens until the stabilizer fully starts, but it is then very quiet. Throughout this review, I will be comparing the Tamron 70-200 VC to the Sigma 70-200mm f/2.8 EX DG OS HSM Lens and the Canon EF 70-200mm f/2.8 L IS II USM Lens. In regards to stabilization sound, the Sigma OS (Optical Stabilization) and Canon IS (Image Stabilization) lenses are both louder – both make an easily audible click when starting and stopping. The Canon provides a less-jittery image than either the Tamron or Sigma when adjusting the framing while stabilization is active. My success with the Tamron's VC very closely matches my success with the Canon's IS and modestly bests my success with Sigma's OS. At 70mm, I am getting a very good keeper rate at 1/8 seconds with a still-good sharpness rate down to .3 seconds. At 200mm, 1/15 second exposures are generally quite successful. These results represent about 4-stops of assistance from VC for me. With each stop representing a 2x difference in the amount of light needed to handhold a shot, 4 stops of assistance is significant. As long as the subject is not moving. From an image quality perspective, the Tamron 70-200mm f/2.8 Di VC USD Lens impresses. From 70mm through 135mm, with a wide open f/2.8 aperture, images are quite sharp from the center to the outer full frame image circle. At 200mm, a modest drop in sharpness can be noticed. Narrowing the aperture 1 stop from wide open usually improves the image quality delivered by a lens. And in this case, the improvement is modest over most of the focal length range - and modest is all that is needed to be fully impressive save at 200mm. At 200mm, the improvement at f/4 is more noticeable (and more needed). 200mm f/4 corners are still showing slight softness that is better-resolved with an f/5.6 aperture setting. 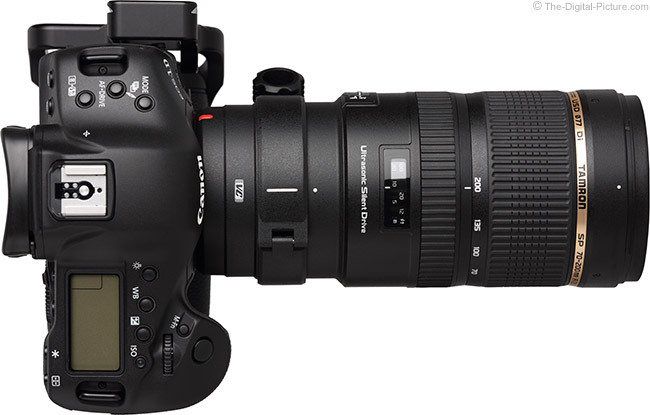 The Tamron 70-200 VC has noticeably better image quality than the Sigma 70-200 OS at f/2.8. The differences are less noticeable at f/4, but the Tamron remains the image quality leader except at 200mm where the Sigma performs better in the corners. You buy a 70-200 f/2.8 to use at f/2.8. Otherwise, buy a Canon EF 70-200mm f/4 L IS USM Lens. It will give you modestly better image quality in a smaller and lighter package – with a lower price tag. Thus, I feel that for most, the Tamron VC is a better choice than the Sigma OS from an image sharpness perspective. The Canon 70-200 L IS II is perhaps the best zoom lens I've ever used – and represents a very formidable competitor to any lens in this class. Surprising is that, at its lower price point, the Tamron 70-200 VC delivers image quality very close to the Canon IS II until the long end of the focal length range where the Canon easily bests the Tamron. Before deciding that you are going to give up that Canon advantage for the lower price, remember that we tend to most-use the full extents of the focal length range in our zoom lenses. And 200mm is perhaps the most important focal length in a 70-200mm f/2.8 stabilized lens. The better 200mm image quality is also translated into better with-extender image quality at the 200mm focal length setting. 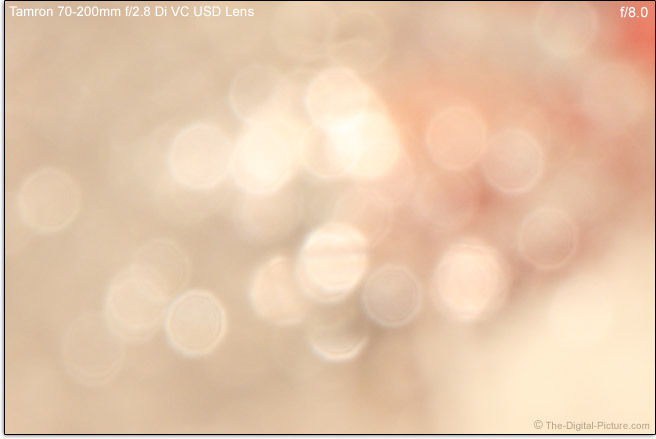 The 70-200 VC has noticeably better f/2.8 image quality than its predecessor, the Tamron 70-200mm f/2.8 Di Macro Lens. 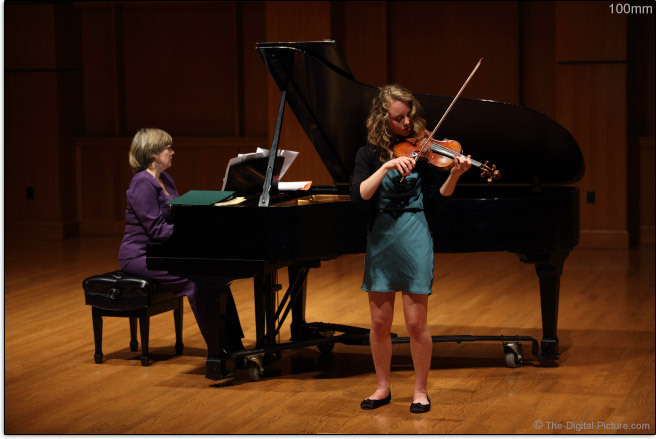 This comparison at f/2.8 shows perhaps the most-improved focal length. Stopped down aperture comparisons between these two lenses show more similarity. As is common, at a 2-stop narrower than wide open aperture (f/5.6), image sharpness is no longer a significant differentiator between all of these lenses. The Canon still delivers slightly better image quality, but the playing field is far more level. Adding to the 70-200 VC's soft corner look at the longer focal lengths is a modest amount of CA (Chromatic Aberration) showing there. The various wavelengths of light are not being focused identically in the mid and peripheral portions of the image circle. Aside from a slight amount of CA at 70mm, this lens is essentially CA-free otherwise. Expect 70-200 VC full frame f/2.8 corner shading to be about 2 stops at 70mm, 1.5 stops at 100mm, 2 stops at 135mm and 2.5 stops at 200mm. As always stopping down reducing the vignetting. F/4 reduces vignetting by .5 - 1 stop and f/5.6 affects a more modest reduction. A minor .5 stops remains visible in 200mm f/8 corners. How does the 2-stop difference in 200mm f/2.8 vs. f/8 vignetting compare in a real world full frame image? Observe below. 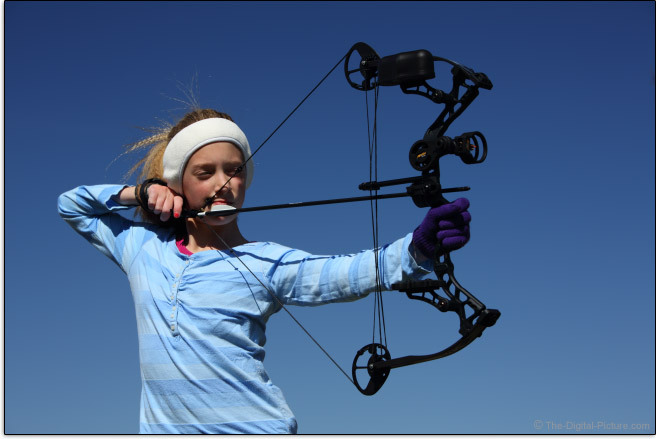 My archer model obviously was not stationary between my shots (or her shots? ), but the sky did not move. The corner shading can be used to draw the viewer's eye to your subject. Or more depth of field with less peripheral light fall-off can be achieved by using a narrower aperture such as f/8 (notice that the bow remains in focus). APS-C format DSLR owners seldom have much to worry about regarding vignetting from full frame compatible lenses. And this is once again the case with the 70-200mm VC. Expect a just-noticeable 1 stop of vignetting at 200mm f/2.8. The Tamron 70-200 VC's vignetting pattern is very similar to the Sigma 70-200 OS's with the Sigma having slightly more vignetting at 200mm f/2.8. The Canon 70-200 IS II has less vignetting – as much as .5 stops less at f/2.8. The stopped down differences are, as expected, less. With 23 lenses in 17 groups, it is not surprising that the 70-200 VC shows a noticeable amount of flaring with a bright light in the frame - like the competitors. The Sigma, with 18 lenses in 15 groups, shows only slightly less flare and the Canon with 23 lenses in 19 groups shows very slightly more. The differences are not enough to be differentiators from my perspective. Zoom lenses, as a strong rule, show barrel distortion at the wide end and pincushion distortion at the long end of their focal length range. The big unknowns are generally: How strong is the distortion? And where is the near-0 distortion crossover point? The Tamron 70-200mm VC lens brings no surprises with a modest amount of barrel distortion at 70mm, a crossover point in the 85mm neighborhood and a modest amount of pincushion by 200mm. The Sigma and Canon lenses are not considerably different in regards to distortion. Also not much different is the quality of the background blur (bokeh) these lenses produce. The Canon uses an 8-blade rounded design while the Tamron and Sigma use 9-blade rounded designs. Here is a 200mm bokeh comparison created using a stationary camera position with the lenses focused at the same distance. Obvious is that the Canon is producing larger blur details – even with a 1-stop narrower aperture (the f/11 example). The Canon has a longer true focal length than the Sigma and Tamron lenses – especially at short focus distances. I'll talk more about this later in the review, but the Tamron also has modestly less focal length than the Sigma in this example. Overall, the Tamron 70-200mm f/2.8 Di VC USD Lens is quite impressive from an image quality perspective. I would like to see better sharpness from the important 200mm f/2.8 setting, but this lens otherwise performs very well. The more expensive Canon remains the better option, but the Tamron's image quality would be my easy choice over the Sigma. Compare these lenses using the image quality comparison tool linked to at the top of the each review. You will see the differences. As indicated by the "USD" acronym in its name, the 70-200mm f/2.8 VC Lens uses Tamron's relatively new and very nice Ultrasonic Drive for autofocusing. This implementation of USD is quiet (you can hear a "shhhh" sound if you listen carefully) and fast. Fast enough that it is hard to discern a difference between it and the Canon EF 70-200mm f/2.8 L IS II Lens in side-by-side comparison over full near-minimum to near-infinity focus distance adjustments. And the Tamron is noticeably faster than the Sigma 70-200 OS in this comparison. With more normal focus distance adjustments, the Canon focuses very noticeably faster and the Sigma becomes more comparable to the Tamron. Hurting the Tamron are the fine-tuning adjustments made after the initial near-in-focus state is achieved. Focusing is internal (filter threads do not rotate with focusing) and FTM (Full Time Manual) focusing is supported. I usually much prefer having FTM, but the rear-positioned focus ring makes this feature a bit of a liability. With my left hand resting on this ring, it is possible to inadvertently change the focus distance setting while composing the final image framing. No focus distance limiter switch is provided. One shot AF has proven accurate, though my copy of the Tamron 70-200mm f/2.8 Di VC USD Lens has a slight, but consistent backfocusing issue on both of my Canon 5D Mark III cameras. Consistent backfocusing can be corrected by AFMA - or by the manufacturer. It is the inconsistent focus accuracy issues that render a lens far less useful. I gave the 70-200 VC's AF system a few good AI Servo workouts. And it performs reasonably well a majority of the time. Troubling is that this lens, at random, will completely fail these tests. I can be shooting a 12 fps Canon 1D X bursts with each frame being in-focus until, for no apparent reason, every frame becomes strongly out of focus. The lens usually fails to recover from this state until a new burst is started. It is like the lens AF system loses its drive train. I have strings of 20+ completely blurred shots. The out of focus images can start on the first shot of a sequence or can show up deep into a burst – when the subject is typically closer and faster-closing the relative distance to the camera. When this anomaly happens, no AF point shows in Canon DPP's Quick View. Aside from this occasional issue, I am satisfied with AI Servo performance. Note that the Tamron 24-70 VC and 70-200 VC reportedly have the same ID from a Nikon DSLR standpoint. This means that any autofocus adjustment done in-camera will affect both lenses similarly. If this is your situation, send the lenses in need of calibration to Tamron. Videographers should note that 70-200 VC subjects change size a noticeable amount during focus pulling at 200mm, but subjects do not change size nearly as much at 70mm. This lens performs better than the Canon IS II, but not as well as the Sigma OS, in this regard. This lens is not parfocal. Zooming from 200mm to 70mm will shift focus to a longer distance. This inverse also remains true – zooming from 70mm to 200mm will shift focus to a shorter distance. As with most zoom lenses, refocus after changing the focal length. There are some interesting numbers in the chart above. The Canon f/2.8 IS II has a significantly higher maximum magnification (MM) spec than the other f/2.8 image stabilized lenses. But, the minimum focus distance (MFD) of these lenses do not appear that significantly great. And actual MFD testing using manual focus places these lenses even closer than the chart above indicates (use the measurements and specs link at the top of the review to see these results). But, the Canon lens indeed produces a very noticeably larger magnification at MFD. The Sigma gives up significantly more of its focal length at MFD than the Canon does. And the Tamron gives up even more. So, one of the Tamron and Sigma shared 0.13x MM values does not appear correct. The Tamron still does not quite match the Canon for max focal length even at longer focus distances. The Sigma also trails the Canon somewhat at distance. This point was driven home for me when I used the Tamron to shoot the product images for the Sigma 35mm f/1.4 Lens Review. I could not get the tighter shots I typically get with the Canon 70-200 f/4 IS that I usually use for these photos. The 70-200 VC is certainly not a macro lens, but unlike its predecessor (and unlike the Sigma 70-200 OS's predecessor), it does not claim to be. This lens will work with extension tubes, but extender compatibility is the feature that can make the biggest magnification difference. This lens is compatible with the Tamron 1.4x and 2.0x SP AF Pro Teleconverters. You add a teleconverter (extender) because you want a longer focal length than is natively found in the lens – because you are focal length limited. And this means that you are primarily interested in the image quality of the lens and TC combination at the lens' longest native focal length – 200mm in this case. This is the focal length we lab test the extender combinations at. Unfortunately for the otherwise stellar-performing 70-200 VC, it's longest focal length is its weak point. Adding a Tamron 1.4x TC to the 70-200 VC creates a 98-280mm f/4 VC lens. Image sharpness takes a noticeable hit at 280mm with a wide open f/4 aperture. Very good sharpness returns at f/5.6 except in the full frame corners that remain soft. The corners are improved at f/8 and further improved at f/11. The Tamron 1.4x TC adds barrel distortion that helps equalize the 70-200 VC's native pincushion distortion. Adding a Tamron 2.0x TC to the 70-200 VC creates a 140-400mm f/5.6 VC lens that retains autofocus capabilities on most Canon EOS DSLR cameras. Images at 400mm with a wide open f/5.6 aperture are downright blurry. Just pretend this lens combo has an f/8 max aperture for practical use. And the image quality at f/8 is only marginal with very poor corner performance. Corners are not good even at f/11. Like the 1.4x, the Tamron 2.0x TC adds barrel distortion that helps equalize the 70-200 VC's native pincushion distortion. Use the "Image Quality" tool link at the top of this review to see these test results for yourself. 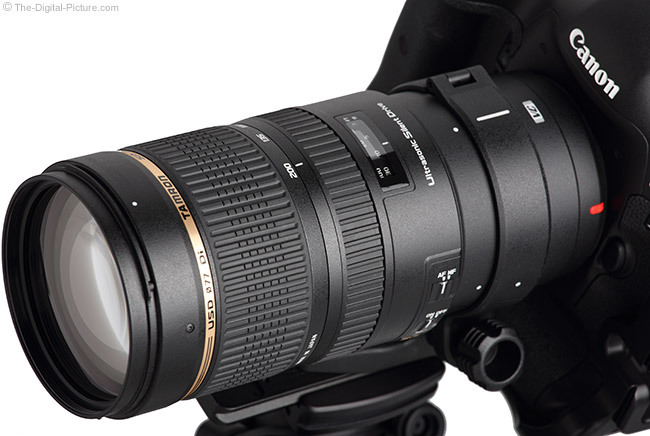 If you have used Tamron lenses recently, the Tamron 70-200mm f/2.8 Di VC USD Lens will look and feel familiar to you. A slightly shiny plastic lens barrel with wide-spaced, deeply ribbed rubber rings and a gold name plate ring. While I prefer the Canon and Sigma from a look and feel perspective, your personal preference may vary. The Tamron's zoom and focus rings are smooth (very slightly scratchy) with no play. Note that these rings rotate in the Nikon-standard direction - opposite that of Canon's lenses (and the Sigma 70-200mm f/2.8 OS Lens). It takes some adjustment if you are used to one rotation direction and using a lens that rotates in the opposite direction. Aiding lens barrel smoothness is the Tamron's flush switch panel. The Canon 70-200 f/2.8 L IS II has twice as many switches in a slightly raised panel, but the switches are nearly flush with the lens barrel just beyond them. The Canon's 2 additional switches control focus distance limit settings and provide IS Mode I and II setting options. The Sigma has a very noticeably raised switch panel. I already mentioned that I do not like the Tamron's rear-positioned focus ring. In use, my left hand's fingers rest on this ring. Especially with the ease that this lens' focus ring rotates, there is a real risk that the focus distance setting gets changed after autofocus lock – by my grip on the lens changing slightly I strongly prefer the Canon design with the zoom ring in the rear. I also like to be able to change focal length without moving my grip hand forward, and I much prefer the lens balance when actively using the rear-positioned zoom ring. This lens has a nicely-sized zoom ring and a relatively narrow-but-quite-usable focus ring. The Canon focus ring has about twice as much surface area. The Sigma focus ring is about the same size as the Tamron's, but it has about half as much rubber grip surface. The Tamron 70-200mm f/2.8 Di VC USD Lens has less focus ring rotation than either the Canon or the Sigma (60° vs. 62° and 72°), but the difference will be immaterial to most of us. The VC also has slightly more zoom ring rotation (143° vs. 137° and 120°). Again, this difference will be immaterial to most. I love the fixed-size design trait these 70-200 f/2.8 lenses share. There is no barrel extension when zooming to a longer focal length. While Sigma, Canon and Tamron are using quality plastics in their construction, 70-200mm f/2.8 lens design requirements dictate that the weight – and size – of such a lens be noticeable. The weight and size differences between the three lenses I've been comparing are insignificant. For many more comparisons, review the complete Tamron 70-200mm f/2.8 Di VC USD Lens Specifications using the site's Lens Spec tool. You are going to know when you have this lens mounted – and you are going to feel the weight in your arms and shoulders if you use the lens for hours on end. But this is not a hard lens to use for most of us. 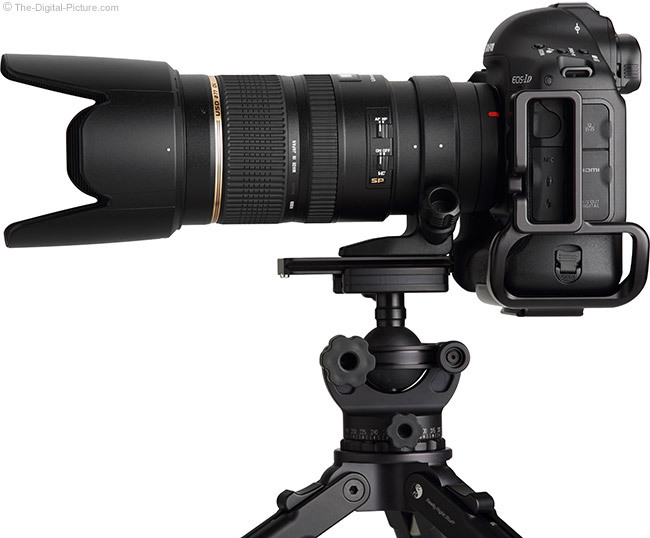 This lens mounted to a DSLR may not fit in your standard zoom lens case. The Lowepro Toploader Pro 75 AW is a case I often recommend for this carry solution. The same lenses are shown below in their fully extended states (the same size in this case) with their lens hoods in place. 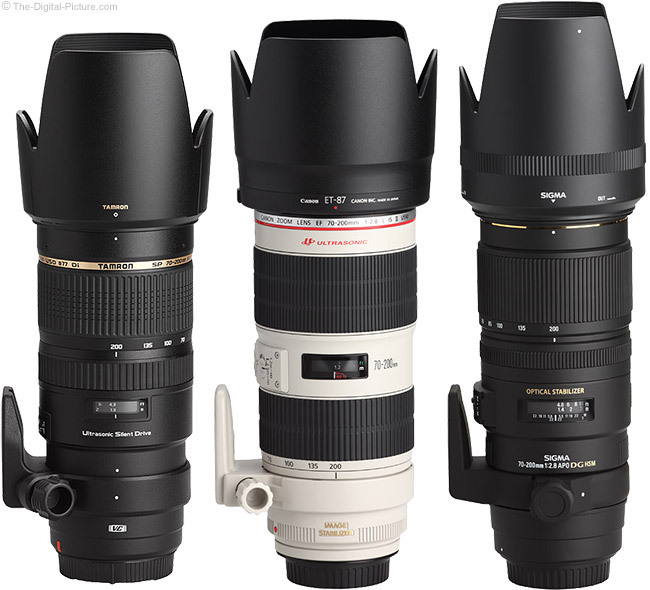 We are looking at telephoto lenses here, and with these lens types come a large lens hood (included in the box with each of these three lenses). Large lens hoods take up more room, but they also provide great protection to the front lens element. Protection from impact, protection from rain and water spray, and of course, protection from the sun and other bright light source. While the Tamron and Canon lens hoods are similar in overall length and shape, the Tamron is shallower on the sides. Canon utilizes a flocked interior to absorb all light hitting inside the hood while the Tamron and Sigma use a plastic interior with ridges designed to prevent reflections into the lens. The Canon design is more effective, but ... few will find the differences to be significant. The Sigma lens hood is longer with less-rounded corners. All three have ends flat enough to allow the lens to sit upright when balanced on them, but ... use this technique with caution. The center-pinch lens cap is easily installed or removed even with this large lens hood in place. As a rule, 70-200 f/2.8 lenses come with a tripod ring (these rings are typically optional for the 70-200 f/4 lenses). The Sigma and Tamron tripod rings utilize a hinged design to allow easy removal while a camera is mounted. The Canon tripod ring does not count on a hinge pin for strength. Accidentally removing the Canon ring is nearly impossible. Accidentally removing the Tamron ring is possible, but not likely as the screw requires about 8 full rotations to fully open. On the other hand, the Sigma quick release friction screw requires less than 90 degrees of rotation to go from really tight to completely loose. At completely loose, only a modest tug outward on the release screw is required to release Sigma lens from the ring. This ease of release makes me a bit nervous. The Tamron tripod ring is nearly as smooth-functioning as the Canon, lacks the Canon's internal release mechanism's bumps and with plenty of friction adjustment available, desired resistance level can be dialed in. The release hinge has a sharp edge that will force you to adjust it so your that hand does not come against it. The Canon ring allows more clearance for fingers wrapped around the lens, but the Tamron and Sigma rings are lower profile. 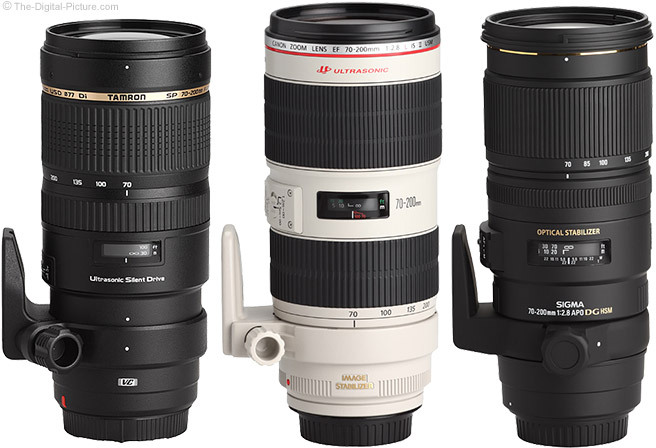 All of these 70-200mm lenses utilize the same 77mm filter size. While they are not small, 77mm filters are one of the most common filter sizes. You will probably want to have filters for each of your lenses, but having a common filter size permits filter sharing. You are on your own for a Tamron 70-200mm lens case as none is included in the box. 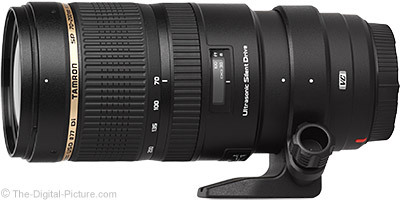 Like the Canon 70-200mm f/2.8 L IS II, the Tamron 70-200mm f/2.8 Di VC USD Lens is a weather-sealed lens. Those comparing the Tamron to the Sigma 70-200mm OS should note that the Sigma is not sealed. My Tamron 70-200 VC was purchased retail. The Tamron 70-200mm f/2.8 Di VC USD Lens, at review time, is available in Canon (reviewed), Nikon and Sony/Minolta mounts. My standard disclaimer: There are potential issues with third party lenses. Since Tamron reverse engineers (vs. licenses) manufacturer AF algorithms, there is always the possibility that a DSLR body might not support a (likely older) third party lens. Sometimes a lens can be made compatible by the manufacturer, sometimes not. There is also the risk of a problem that results in the lens and body manufacturers directing blame at each other. Canon's 1 year warranty does not compare to Tamron USA's 6-year warranty. Why buy a third party/non-camera-manufacturer-brand lens for your camera? The third party lens may have better quality – with better image quality being an especially attractive advantage. The third party lens may have an important feature that the camera brand does not offer – a unique focal length range for example. Or, the third party lens may be less expensive. That last reason is the most common reason people buy third party lenses. And it is the primary reason to buy the 70-200 VC over the Canon equivalent lens. If you can afford it, the Canon EF 70-200mm f/2.8 L IS II USM Lens remains my strong recommendation for a lens in this class. If you budget is not strong enough for the Canon, I highly recommend the Tamron 70-200mm f/2.8 Di VC USD Lens. While it is not an inexpensive lens itself, the 70-200 VC delivers image quality worthy of its price. This lens is going to deliver some great images.